A lot of people ask me “Hey Peter Peter Portland Eater, you seem to have a reasonable grasp of the food and beverage happenings in Portland, so where exactly should I eat when I visit?” I usually follow up with some questions about what type of food they’re looking for and how much they want to spend and then I make some suggestions and potentially point them in the direction of the awards articles I release at the end of every year. However, I thought the perfect opportunity to help my loyal readers find the best places to visit presented itself when I had a friend from out-of-state over for a weekend and planned a food and beverage extravaganza. My buddy arrived on a Friday afternoon ready to consume lots of food and wash it down with a moderate amount of booze. We enjoyed the warm weather in my backyard and before long, our stomachs started growling, demanding some nourishment. As he went down the list of foods he might want to eat, he seemed most eager for burgers and fries. I quickly made the decision to visit Nosh on Congress St., one of my favorites and a great place to pick up some man-food. We headed into Portland ready to chomp on some beef and potatoes after of a bit of a scenic drive through Cape Elizabeth, South Portland, and then Portland. We got to Nosh and a review of their brand new menu revealed some changes since the last time I had been there. Before deciding on food, we each ordered a Yeti Imperial Stout from Great Divide Brewing Co. out of Denver. Once the beer order was out of the way it was time to pick our lunch items and it didn’t take long at all. We both wanted the Sweet and Spicy Bacon Cheeseburger – Nosh patty, cheddar cheese, sweet grilled onions, smoked bacon, sambal mayo, grilled brioche bun. Then we added an order of Bacon Dusted Fries with a side of chipotle mayo and were ready to get to work. Our orders came out quickly and Nosh did as they always do, producing excellent, over-the-top burgers with intense flavor combinations over a base of perfectly seasoned pork and beef patty. The fries stood the test of time, proving to be just as good now as they were years ago when I first had them. I also recommend the chipotle mayo dipping sauce. That stuff was super, though there are a number of excellent sauce choices that I’m sure are all superb. We eventually finished our food and beer and were ready to go relax a bit before going out for drinks and dinner later on. Once we killed a little time and digested the burgers, I had a plan to get the evening started quickly with one of the coolest drinks anywhere. We made our way to Tempo Dulu at the Danforth Inn, where the summer heat made it a slow night, but we welcomed sitting inside with air conditioning. Pulling up to the bar and grabbing two seats, the bartender handed us drink menus and I quickly handed them back. “We know what we want,” I said. He pretty much did too. The Jakarta – Knob Creek Rye, Averna Amero, Cynar, Carpano Antica Vermouth, Coastal Root Bitters, absinthe mist, smoked Chinese 5 spice. There was no doubt about it. The award winning drink is one I am willing to buy for myself and others even at a hefty 15 bucks each. It’s not just that the whisky wonder tastes like it was birthed from the fountain of the gods, but the preparation of the drink itself is an event worthy of a crowd. As the bartender poured precisely the right amount of various liquors into a single measuring glass with ice, I was anxiously awaiting the headlining act. The presentation hit it’s climax as the bartender hand picked whole Chinese five spice to place on our “drink board”, misted the glass in absinthe, torched the five spice, and then simultaneously blew out the flames and covered it with the glass. During the process, my buddy was amazed as the show created a magical ambiance. 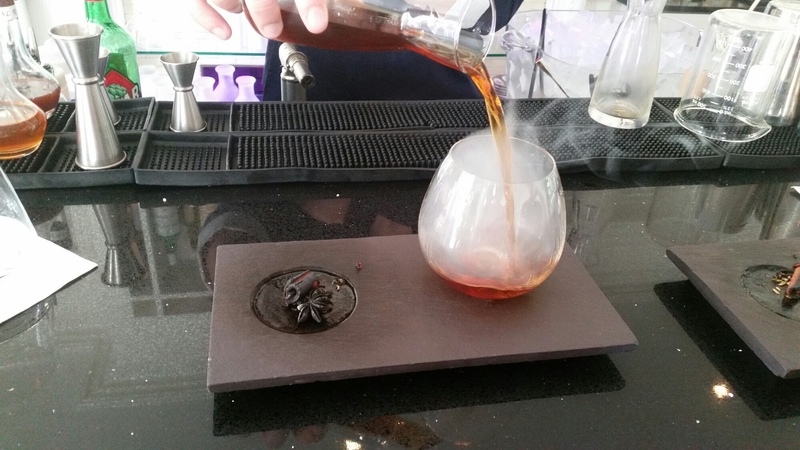 The drink was poured into the smoked glass and as the aromas filled the air, it was ready to consume. It was even better than I remembered as my senses were hammered with what is most definitely a majestic cocktail. While drinking and talking with the bartender, we peered at the bar menu, and I made note of some excellent choices to eat next time I sat there for anotherJakarta. We took our time to savor every last drop of the drink and then headed out to the water for some food. Once we got to Commercial St., I veered toward J’s Oyster Bar, knowing that the long-standing dive always produced amazing, fresh seafood served a side of awesome sauce. We asked for the first seating available and were instructed to get a drink a the bar while waiting. However, the bar had plenty of open seats and we grabbed two of those. The bartenders were happy to slide menus our way and I ordered a Sam Adams Lager while he went with a simple lemonade. With that, we started entertaining food. I was certain that I wanted a cold item since it was a scorcher of a day. He was thinking of ordering a hot item, but when I suggested either a lobster or crab roll, he thought he might try the first lobster roll of his life. 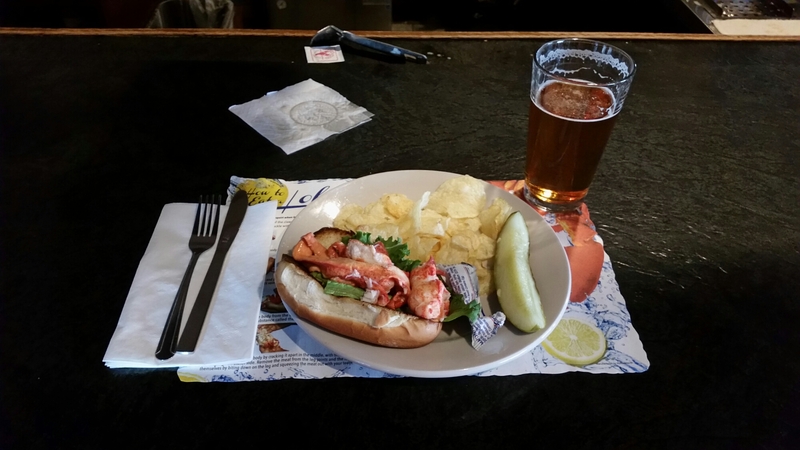 We settled on the rolls as our final answer and happily waited with our beverages while the J’s Oyster crew shoved a little lettuce and large pieces of lobster meat into a toasted hot dog roll. When it arrived with chips, pickle, and a packet of mayo, I knew I had hit the jackpot. Both of us shoved a bite of the lobster into our faces – his sans mayo and mine with the mayo added. I enjoy a little condiment and squeezed mine on there, but the option to just have the clear meat is a good one too. Lobster doesn’t get any fresher than what was on that roll and the sandwich that makes Maine go ’round was a really powerful intro to Maine seafood for my bro. J’s quietly serves one of the best examples of a lobster roll the state has to offer and I always love their divey atmosphere and on-the-water location. Dessert was in order and my buddy suggested ice cream, but I pulled a minor swerve by walking up to Fore St. to go to Gelato Fiasco. 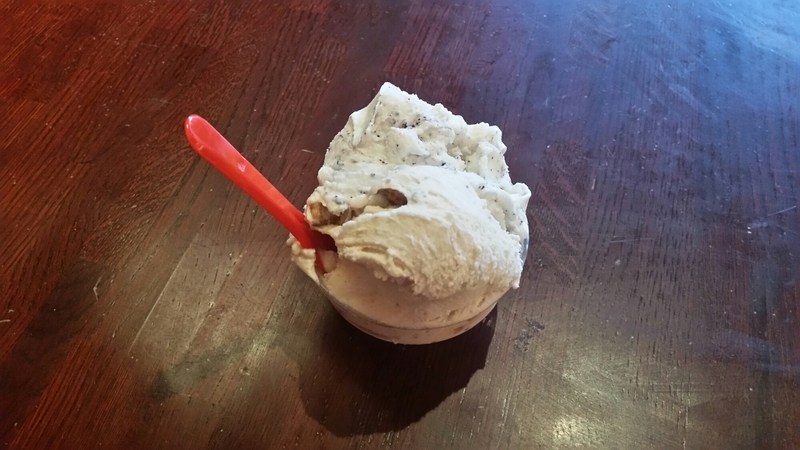 With lots and lots of flavors made in small batches, Gelato Fisaco offers something for everyone, also serving a number of Sorbettos for those looking to avoid dairy. We both ordered a couple flavors – you can order as many as you want in a single serving – and found a seat to consume our concoction of the cold. I dipped into my half mint cookies and cream/half peanut butter cup dish and was pleased with it’s cooling effect on a hot summer night. GF’s product tastes real because it is real, with everything made in-house and without garbage ingredients like artificial flavors. The mint in mine tasted like actual mint, not something produced in a food lab. We took lots of little bites with our tiny spoons, took advantage of their recycling bins, and left for wherever Portland would take us the rest of the evening. 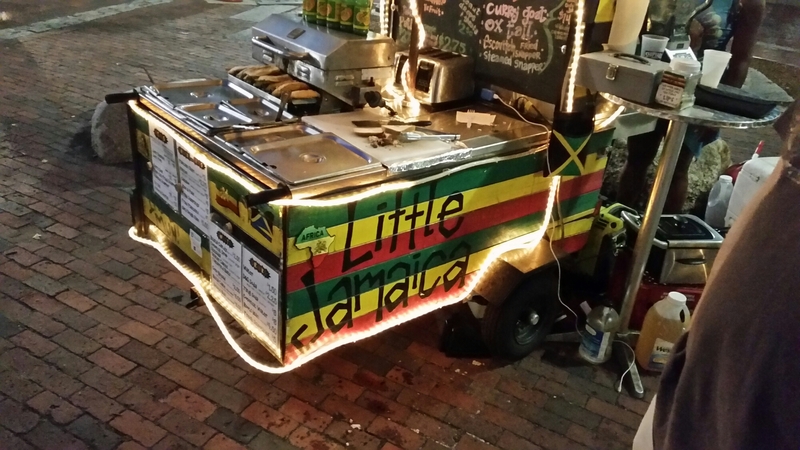 A walk around the Old Port eventually led us to the corner of Middle and Exchange where a Jamaican jerk cart sat waiting for us to approach. Little Jamaica offered some solo jerk chicken for a mere ten bucks. Once ordered, the jerk lady – who wasn’t a jerk at all – pulled out a whole leg of chicken, commandeered a cleaver, and cleaved the hell out of the bird. After a quick warm up, it was ready to eat and we found seats where we could pick at it. The chicken was tasty, but the chopped bone made it a little difficult to navigate the edible portion of the chicken while avoiding chewing a bony bit. Still, the slightly spicy meat was a nice second “dessert” of the evening. As we ate, we waited for word from my wife about where she and her friends were in their evening out and found out they weren’t ready to give us a ride home yet. We arranged a street meeting location and figured they would have an idea about where they wanted to go next. You can find Little Jamaica on Facebook. It turned out that my wife and her crew wanted to hit Glass cocktail lounge at the bottom of the Hyatt on Fore St. With lots of signature cocktails under the headings Stong, Savory, Bitter, and Fresh, they had lots of choices and it seemed each drink was a combination of many ingredients. I wasn’t feeling like beer or wine, but decided it was too late for me to make a decision on much of anything beyond that, so I went with a simple vodka cranberry. My buddy ordered an Atlantic Brewing Coal Porter and the ladies went with a bottle of bubbly. Our drinks were happily consumed and that proved to be the end of our night as lots of yawns filled the room while we drank our last drops. It had been quite a night, but I was prepping mentally to give my visitor an additional taste of the Portland life the next day as we would have lots of time to explore everything Portland had to give. You can find Glass on Facebook. 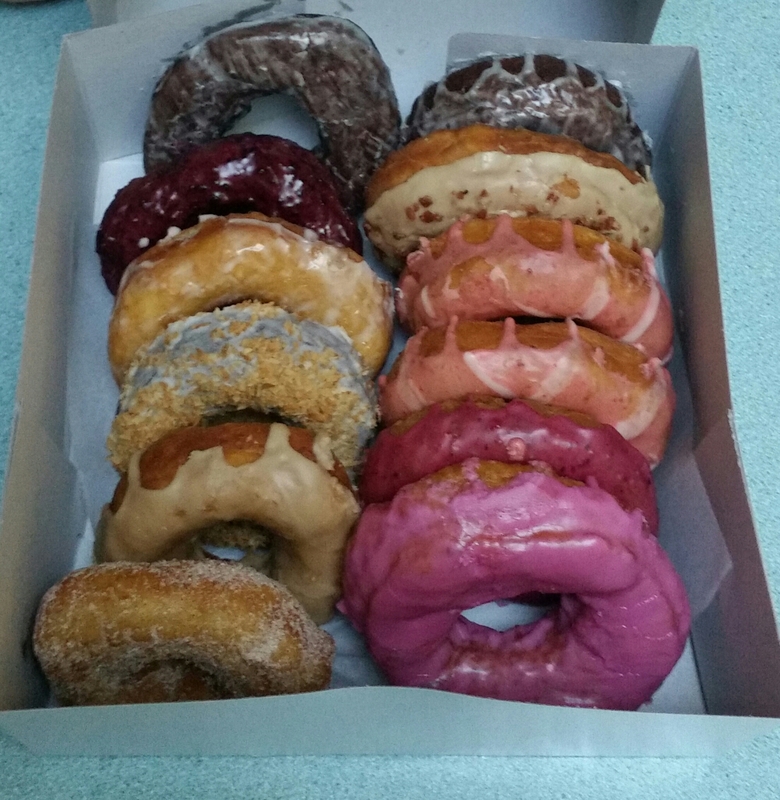 Saturday morning started with a trip to The Holy Donut on Exchange St. We waited in a long line, eventually ordering a dozen donuts, picking flavors like triple berry, pomegranate, maple bacon, dark salted chocolate, and the like. After all 12 were in the box, I stared at the assortment of deep fried potato donuts made with no artificial anything and got ready to dig into their warm, fresh cakiness. First though, I had to make a stop at Bard Coffee just a hop away on Middle St. for some cold brews. At home and only a single bite in to a donut, I remembered how the dense torus of taste made me so happy in the past and was doing so once again. I couldn’t get enough, preferring their fruit flavors and secondarily their chocolate frosted ones. I took sips of my cold, better-cause-it-ain’t-bitter brew in between donuts. Cold brew made me give up on my “only hot coffee” stance and Bard’s is excellent. If you like it a little frothy, order a nitro cold brew and you might think you’re drinking a Guinness…okay, maybe not. The donuts did their job and I had to stop at three for fear that I wouldn’t be able to eat the rest of the day. My guest also stopped at three, leaving some for later which was fine with me. The donuts and coffee got the morning started right and it was time for a bit of a rest before we engaged in more eating and drinking shenanigans. We figured it might be smart to recharge our old batteries after a lateish night and relatively early morning. 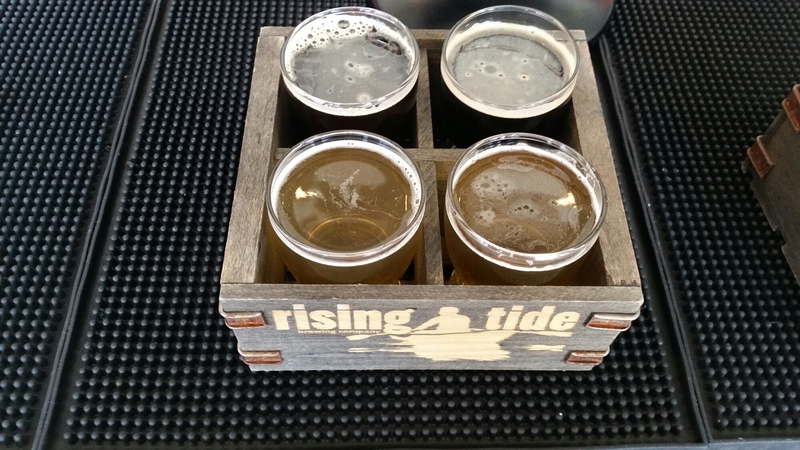 A little after noon, we got it together and went to Rising Tide Brewing on Fox St. for some suds. Deciding on a couple samplers, we each ordered the Pisces gose tart wheat ale, Eté summer saison, Ursa Minor weizen stout, and Portside Porter. We sat at an outdoor picnic table sampling the delicious brews, sipping each one carefully to get its full flavor. As I often do, I preferred the porter and stout the most, but they were all good for certain. While we were at the brewery, we saw the Brew Bus arrive – they’re everywhere there is beer – and observed as the food truck next to us kept busy. It was a beautiful afternoon and that combined with a little beer was just what the doctor ordered. 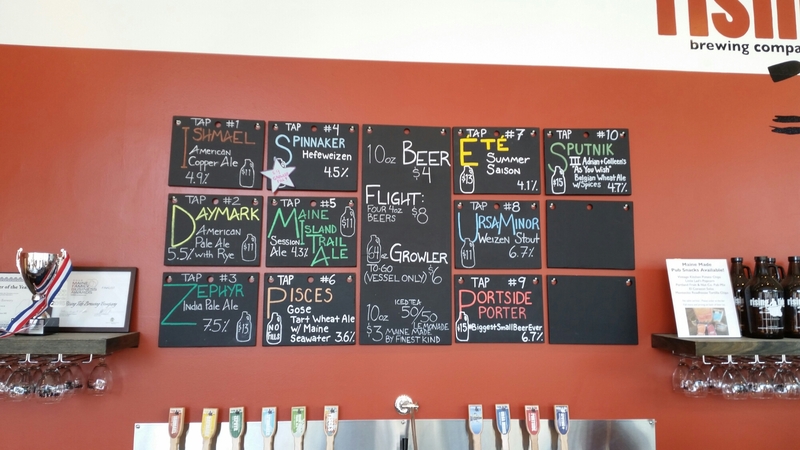 Once the beers were in us, we went next door to Maine Craft Distilling to try just a few samples before we decided on a place to eat. There, we dipped into the Fifty Stone single malt whiskey, the Sprigge barrel rested gin, and the Blueshine blueberry moonshine. As I already knew and as my partner in crime that day agreed, they were all sure winners. 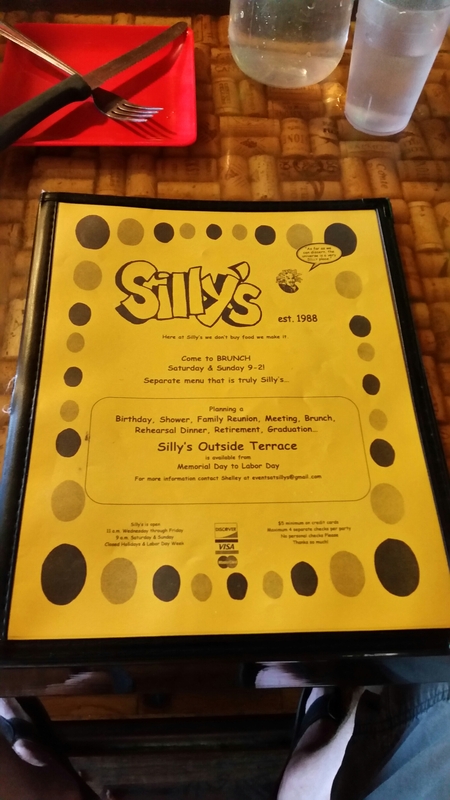 We had to decide on food, and a short walk took us to Silly’s on Washington St. Silly’s mishmosh of a menu is one of the weirdest, most awesome conglomerations of food in existence and I figured whatever we picked would be the perfect after-beer compliment. I have a ton of go-to foods there, but I always consider something new too. I listed my favorites from the menu and we decided to share the Pork Bootie Nachos – flour tortillas topped with smoked pork, BBQ sauce, caramelized onions, jalapenos, cheese, and sour cream. We stuck with just water and went to town on the nachos, making a job out of eating them. I felt they were probably even better than last time I had them. Adding a solid amount of Silly’s hot sauce to the chips, I went crazy on the meaty, sweet and spicy, cheese-doused delights. These were no ordinary nachos, but extraordinarily heavy, well appointed chips. We ate for what seemed like forever and were finally done, leaving about four chips behind. The nachos were enough for us both because we had to be mobile to continue our walking tour of the town. We paid our bill and eventually left. The nachos by themselves were pretty inexpensive and we definitely got our money’s worth. We began walking off the nachos around Congress St. and the Old Port. After a bunch of stops and looking around at various non-eatery locations, we made our way home for a few to recoup and decide our next move into the foray of food and drink the weekend had become. It wouldn’t be long before we knew what was next. 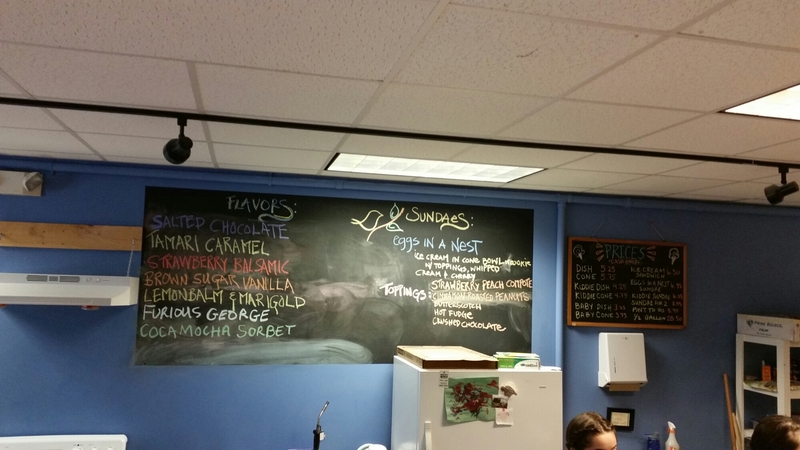 One of my favorite locations on earth took us to Main St. in Westbrook for some ice cream at Catbird Creamery where the flavors were locked and popped. After trying a sample of the Lemon Balm and Merigold, I went with a couple favorites – Furious George and Strawberry Balsamic – opting only for the ice cream with no toppings. My buddy opted for the Coca Mocha Sorbet and Strawberry Balsamic. I had initially figured he was the person who traveled the furthest to go to Catbird that day, but there were people in front of us from China, so we didn’t win that game. The first taste of my order was incredible I can never figure out how Catbird makes the creamiest, dreamiest ice cream on the planet, but it was no different that day as the strawberry balsamic packed in more flavor than ever and the furious one was as good as it always is. As with all the places in this article, it’s difficult to believe there are people in the area that haven’t been there yet. We consumed everything we had, verbally noting that it was “just so good” over and over. Our kiddie sized dishes proved to be more than enough and we were on to more adventures. After ice cream, we revisited the home briefly to get some socks because we decided that bowling would be the right thing to do. We made a stop at Easy Day on Broadway in South Portland and after getting our hands on a couple pair of bowling shoes, we picked a couple balls and got to rolling them and dropping some pins. We spent a little over an hour there where I won three out of four strings with my really poor bowling technique. Unfortunately, we passed on any food and drink since we were still pretty full, though they have a pretty good menu for a bowling alley. Once we wrapped up, we went home and watched the Knife Show on TV and caught some z’s. As I awoke on Sunday morning, I knew I had one last chance to impress my guest before he left to go back home. The only choice for breakfast was Scratch Baking in Willard Sq. in South Portland. Scratch serves all kinds of amazing treats, but the line that forms for bagels every morning is certainly a good sign that those are some of their A+ offerings. After grabbing a couple of the seeded ones and a Maine sea salt, I picked up some herbed cream cheese. As I waited in the long line to check out, I couldn’t help but add a New York Crumb Cake, a Raspberry Caramel Muffin, and an Almond Horseshoe to my purchase. Once home, I reveled in the fact that I had made a nearly perfect buy at the bakery. The fresh herbs in their cream cheese are a game-changer and their amazing bagels go perfectly with it. I’ve never had anything there that wasn’t top-of-the-line delicious and I happily ate two of the bagels with lots of cream cheese, saving the other goodies for later in the day. As my guest made his way through a bagel and then gathered his belongings to leave, he seemed to be very happy with the weekend, so it was a success. It was a great couple of days. I got to see a friend I hadn’t seen in a few years and took him all around town, choosing my favorite places to eat and drink, and we had a great time. There are obviously endless other locations we could have gone to that would have been great, but I chose places that were both some of my absolute favorites and also fit the weather, mood, and action we were looking for. Want to go out in Portland and have a good time? Definitely check out all these places and click on the links to learn more about my past experiences there or check out their websites. In the end, it’s all about having fun, and the places listed above are all giants on the “fun places to go” list. 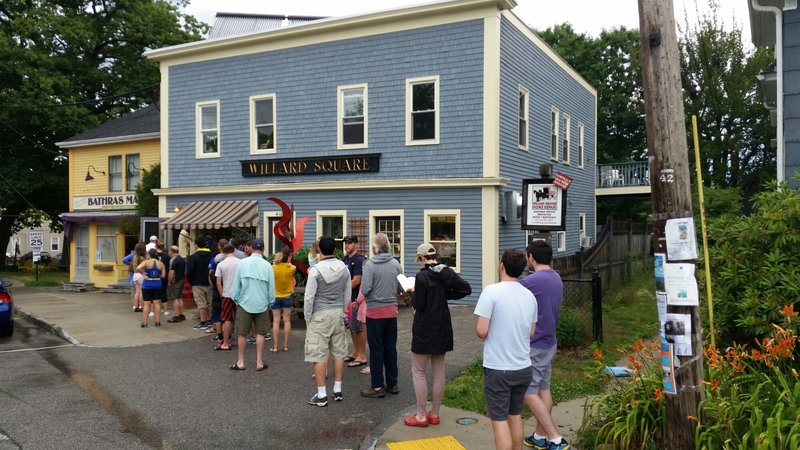 This entry was posted in Portland, ME food on July 21, 2016 by peterpeterportlandeater.